Property Size 2,605 sq. ft. 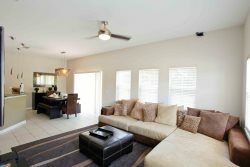 This single family house, located at Veranda Palms Resort enjoys easy access to Orlando's attractions and restaurants, while offering a comfortable and peaceful retreat for guests to enjoy - with a private pool & spa and a nice game room. Whether you are looking to plan a business retreat or a fabulous family/friends gathering for a dream vacation, this home definitely will take care of your needs with perfection! Veranda Palms is a gated community with access to the conservation area, basketball court and playground. Located just 4 miles to the gates of Disney and 5 miles to Interstate 4 giving access to Universal Studios, Seaworld, Wet and Wild and Premium Shopping Outlets, the resorts amenities include gated community, walking trails, and is next to the Shingle Lake Preserve. This luxury resort sits nestled just outside of Orlando, Florida and has quickly become one of the most desired resorts in the Orlando area. A princpio ficamos no complexo da Disney e depois fomos para a casa. Valeu a experincia do complexo, mas em outra ooortunidade ficaria s na casa. Eu e minha famlia nos sentimos em casa, a mesma muito confortvel, atendeu as nossas expectativas. O condomnio muito bom e a localizao muito boa. Com certeza vamos voltar. Everything was comfortable and spacious. Overall the stay was very nice. Team members were very professional and friendly. If you had any questions, they were promptly answered. We were even able to get an extra day for half off. Thanks so much for that! We really appreciated it so much. Thanks for great service.. The house was as pictured, and just as beautiful. There was plenty of room to move around, and the game room, was certainly used a lot! It was quite comfortable, and the beds were also. We enjoyed the quiet of the neighborhood, with very little traffic noise, or noise from neighbors. Close to great shopping and many places to visit. If you are considering Magna House, it is a great place to stay. Easy to book, and when I called with questions they where very knowledgable on the rental agreement. Always polite! when we arrived we were very impressed with the cleanliness. Pool guy was actually still cleaning patio area but we were fine with that. Peaceful neighborhood and easy together everything we had planned. I dealt with Camila a lot and she was very very nice an professional and I kept calling her or emailing her to get more information or ask questions, and she always helped me. I appreciate her kindness and her assistance while we were there. The house was very nice, the only thing that I would add is some tables outside so when you grill you can sit out side and eat. Other than that the property was GREAT!!!!! The hostess was very helpful and professional. The house is exactly as described. Very quiet environment.